Serendibite is a rare borosilicate mineral that is very rare indeed in crystalline form. 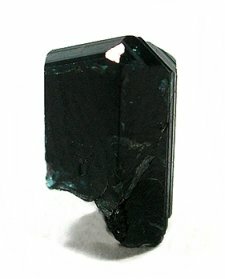 At one time crystalline serendibite was one of the rarest gems in the world and only a handful of specimens were known to exist. But a recent find in Burma has made a limited amount of material available to collectors at reasonable prices. The first documented discovery of serendibite was in 1902 in Ceylon (now Sri Lanka) by G.T. Prior and A.K. Coomaraswamy. They named the mineral after an old Arabic name for Ceylon, serendib. Some gem-quality material was found in the Ratnapura area of Sri Lanka in the 1990's. Then a new deposit was found in the Mogok Valley in Burma in 2005. These remain the only sources known in the world for gem-quality serendibite. Gemologically, serendibite has a complex chemical composition consisting of calcium, magnesium, aluminum, silicon, boron and oxygen. It can easily be confused with sapphirine and zoisite, but its refractive index, twinning, and spectroscopic features are distinctive. Serendibite has a hardness rating of 6.5 to 7 on the Mohs scale, with no cleavage. Its refractive index is 1.701-1.706 (similar to zoisite) and it has a density of 3.42-3.52 (similar to topaz). Serendibite forms in the triclinic crystal system. The Sri Lankan gems tend to occur in greenish-blue or violet-blue, while the Burmese material is a very dark bluish green that usually appears black. Serendibite has an attractive vitreous luster when polished. The gem quality serendibite is transparent, thought the Burmese material is so dark as to appear opaque.